Known as the best female golfer of all-time, Annika Sorenstam is coming to New Zealand for the inaugural ANNIKA Invitational Australasia, which is set to tee off tomorrow at the Royal Wellington Golf Club. Sweden’s queen of golf Sorenstam, whose first professional win came across the Tasman at the 1994 Women’s Australian Open, went on to win 10 major championships as part of 93 worldwide wins, making her one of golf’s all-time greats. With the stardom of Sorenstam comes talent from around the world with players aged between 12-18 competing in the 54-hole event, including some of New Zealand’s best female amateurs with eight of our top ten order of merit players featuring. 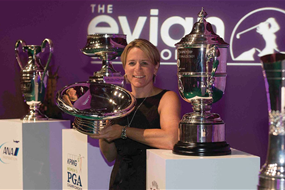 “I can’t think of a better place to close out our 2018 season than New Zealand,” said Sorenstam, who will headline a gala dinner for competitors, as well as lead a skills clinic focusing on both on-course and off-course tips for success. After an exciting week at the Toro Interprovincials in Chirstchurch, the entire Auckland team who claimed their seventh win in eight years will feature at the inaugural event and be aiming to continue their run of form. Carmen Lim, Vivian Lu, Miree Jung, Grace Chung and Fiona Xu were unstoppable last week claiming 35 of a possible 40 points in the match play format, but will be competing against each other for the chance to earn one of three spots available in the ANNIKA Invitational presented by Rolex at the World Golf Village in Florida. Coming off an unbeaten match-play campaign in Christchurch is local hope Darae Chung who will be a contender this week having played the most golf at Royal Wellington. Her continued improvement is timely as she searches for a breakthrough victory. The field also features talent from around the world with rising star Yuka Saso travelling from the Philippines to play this week. Saso was so good at the inaugural Women’s Amateur Asia-Pacific in Singapore where the world number 35 made the four-way playoff alongside New Zealand’s Wenyung Keh to only fall just short of victory as well. There is also a large contingent of Australians in the field this week with 14 of their best young talents looking to make their mark in New Zealand. They will be led by Grace Kim who is the third highest ranked in the country and has enjoyed a stellar 2018. This New Zealand leg makes a fifth continent for the Swede’s famous events which includes North America, South America, Asia and Europe that culminate in the ANNIKA Invitational USA in Florida, January 2019. Since the inaugural Foundation tournament (the 2009 ANNIKA Invitational USA) 45 ANNIKA event alumnae have earned LPGA cards. Twenty-four alumnae competed in the 2018 ANA Inspiration. The opening round will tee off at 8:00am tomorrow and is free entry for all spectators.